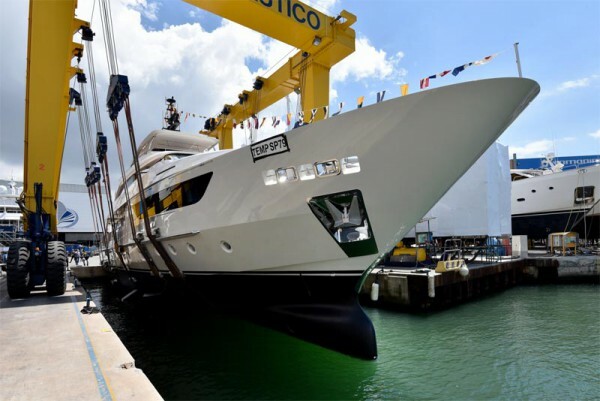 The semi-displacement Sim Sim was launched from Sanlorenzo’s facility in Viareggio and continues what has been a prolific start to 2017 for the builder: in fact, since Seven Sins, the first in its new 52Steel line, hit the water in January, it has launched two units of the SL86, two of the SL96, and the 460Exp Ocean's Four. Powered by twin MTUs for a top speed of 18 knots and with in-house naval architecture, Sim Sim is a tri-decker of 126 feet in length designed by Francesco Paszkowski with lines that Sanlorenzo claims recall the classic shapes of the transatlantic liners from the 1930s. Accommodation is for 10 guests in an owner’s suite, two doubles and two singles (plus six crew members). As with all Sanlorenzo models, the interior styling reflects her owner’s personal preference with oak wood floors and furnishings. Sanlorenzo builds its composite models at its production sites in Viareggio and Ameglia, whereas the steel and aluminium yachts are constructed at its facility in La Spezia, where hulls in the 52Steel, 460Exp and 40Alloy series are in progress, plus the brand's 64Steel flagship.